The desktop version of Cisco Packet Tracer (CPT) is currently available in three flavours: 32-bit and 64-bit versions for Windows 7, 8.1 and 10 and a 64-bit version for Linux. There is no macOS version so I decided to install the 64-bit Linux version of CPT (7.1.0.0222)1 on Ubuntu 16.04.3 LTS running on VMware Fusion (10.1.1). UPDATE 1st September 2018: CPT 7.2 was released on 21st July 2018 which doesn’t appear to need libicui18n.so.52 as detailed in this article and runs without issue on Ubuntu 16.04 LTS. However, there’s now an issue with CPT 7.2 running on Ubuntu 18.04 as it can’t locate libpng12.so.0. The answer from Lucas Almeida on StackExchange regarding installing libpng12.so fixed it for me. I should mention that I have limited experience with Ubuntu and Linux in general. I merely enjoy dabbling when I need to and am unsure of the dangers or repercussions – if any – of the procedure detailed below which involves having two versions of the same library installed on one system. In my case, having Ubuntu on a VM solely for the purpose of running CPT presents little risk. Your situation may differ. I followed the Installation section of these instructions to install CPT. It appears the correct library is installed, but CPT requires an older version – 52 instead of 55. A Debian package containing the older version of libicui18n is available at http://security.ubuntu.com/ubuntu/pool/main/i/icu/libicu52_52.1-3ubuntu0.8_amd64.deb. In summary, the Linux version of CPT (7.1.0.0222)1 requires an older version of the libicui18n library not available in Ubuntu 16.04.3 LTS. CPT (7.1.0.0222)1 will run on Ubuntu 16.04.3 LTS providing the older libicui18n.so.52 library is installed alongside the newer one. As a side note, I found that CPT (7.1.0.0222)1 does run without issue on Ubuntu 14.04.5 LTS where the required older version of the library is installed as default. 1 CPT was updated to version 7.1.1 on 8th December 2017, but will still not run unless the older libicui18n.so.52 is installed. share your opinion if you try it. Thanks a bunch for this post, helped a lot. Now, you might want to update the file to be downloaded, since http://security.ubuntu.com/ubuntu/pool/main/i/icu/libicu52-dbg_52.1-3ubuntu0.7_amd64.deb is not there anymore, but http://security.ubuntu.com/ubuntu/pool/main/i/icu/libicu52-dbg_52.1-3ubuntu0.8_amd64.deb is, instead. Minor version change. Thanks for the heads-up. Have updated the package name. my CPT starts but only via CLI. I tried to make Dash icon and I can actually see it there but its not starting when I click on it and its not normal icon, its just invisible picture. Can you help me to solve this? The instructions I used to install CPT – and linked to at the beginning of this article – also contain details on how to create a Dash icon. I’ve just followed these and created an icon on the Desktop which successfully launches CPT. 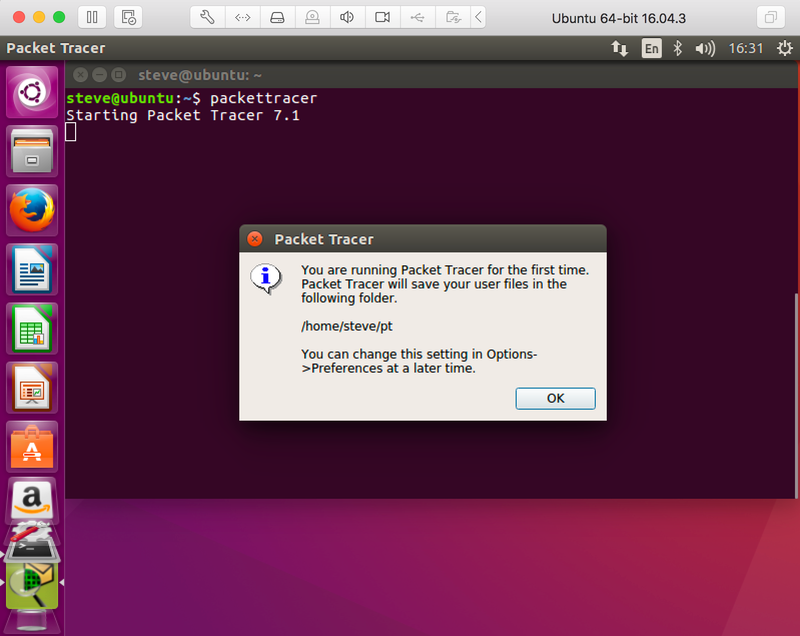 In my case, I replaced cp /opt/pt/bin/Cisco-PacketTracer.desktop ~/.local/share/applications/Cisco-PacketTracer.desktop shown in the instructions with cp /opt/pt/bin/Cisco-PacketTracer.desktop ~/Desktop/Cisco-PacketTracer.desktop to place the launcher on the Desktop. Thanks for linking my instructions Steve! Credit where credit’s due. Your instructions were key to me successfully installing CPT on Ubuntu and helped focus my efforts in solving why CPT wouldn’t run. Thank you. Now, if it shows a list of “libqt5xxx” missing libraries, please install them all. Remember, just write everything that is behind the first . and to put the * in the end of the name of the package. Thanks a lot for this tutorial, Steve! Helped me a ton. This is a great post, useful and to the point. Thanks to you Packet Tracer 7.1.1 is now happily running on Xubuntu 16.04 64 bits in about 10 minutes. I’m running on Kali Linux and have the exact same issue except the file I need is libcrypto.so.1.0.0 and nothing seems to work for getting it. I’ll have to have another go at this when I’m less tired and see if I can sort it. This maybe of some help. It deals with Kali Linux, libcrypto.so.1.0.0 and CPT 6. I’m trying to install PacketTracer 7 and I followed all instructions you (and other ‘gurus’) provided but…It didn’t work. I really tried to install those libraries above, but I failed. Miserably. Can you help me? Sorry you’re having trouble getting CPT to run. Both libQt5Script.so.5 and libQt5ScriptTools.so.5 are installed as part of the CPT installation in /opt/pt/lib/. If they’re not there, then I suspect CPT is not installed on your system. Remember, this article doesn’t cover how to install CPT, but does include a link to the installation instructions I used. If those files are present, then ensure you’re not trying to start CPT with PacketTracer7 in Terminal. You need to use either /opt/pt/packettracer or the symbolic link packettracer. See my reply to Momcilo’s comment further down the page. I did a complete re-install, from scratch and following your guidance, it finally worked. Thank you so much. I followed your instructions and finally made it on Ubuntu 16.04 LTS. Thank you. After some tweaks here and there. Cisco Packet Tracer version 7.1.1 works in Loki. You are an extraordinary living legend. All the best for you!!! I tried to execute sudo updatedb, but no clue. Please help. I’m not familiar with Manjaro nor Arch Linux in general. updatedb manages a database used by locate. The equivalent of locate in Manjaro appears to be mlocate. As for installing the package containing libicui18n mentioned in the article, this is a Debian package for Debian-based Linux distros such as Ubuntu. Not sure if it should – or can – be installed on Arch-based Linux distros. See here. Thank you steve it worked..
thanks you a lot. Your article has helped me from wasting ton of times. You need to run /opt/pt/packettracer which first sets the LD_LIBRARY_PATH variable to tell CPT where to find the shared libraries it requires and then executes PacketTracer7. If you run PacketTracer7 directly the LD_LIBRARY_PATH variable is not set and will result in the errors you’re seeing. NOTE: If you had the CPT installation create a symbolic link named packettracer in /usr/local/bin you can run packettracer instead of /opt/pt/packettracer. and redirected me to their web page when I log in and it currently up and running. I think enrolling with the Cisco Network Academy (NetAcad) is a pre-requisite for downloading Packet Tracer from their site. It certainly is for running it. There are plenty of alternatives to download to avoid logins. I use this cisco.shamshid.com, where the guy updates on time. I wasn’t aware that CPT could be downloaded from elsewhere. Thanks for that. Two things I noticed: 1. The version I downloaded form cisco.shamshid.com still won’t run until the older version of libicui18n has been installed. 2. It still presents a login prompt for NetAcad. So, IMHO there doesn’t seem any advantage to using this download location. Hey this was very helpful. Big thanks!!! Extremely helpful and clear. Thank you very much for taking the time for this great contribution. PD: From this post, I could not tell the fact you mentioned of you having limited experience with Ubuntu or Linux in general.